Action Play Systems' ADA Half Ramp has been designed to work with new playground installations or for adding accessibility to an existing playground. The ramp is designed to mount independent of playground borders, allowing the ramp to be used with virtually any pre-existing border system. Action Play Systems also offers 8-inch and 12-inch high playground borders, as well as a full line of replacement swing parts and swing/slide wear mats. Columbia Cascade is the industry leader in long hillside and shorter berm slides of one-piece stainless steel or modular plastic. Chutes are available in almost any length and in unique widths and configurations to accommodate multiple users. Tubular, wave and "S"-curved configurations are also offered. Choose from entrance gateways of steel, timber or recycled plastic. Several examples are shown on the website. Netplex™ is what's next in play! Pushing kids beyond their expected boundaries, Netplex is a hub of multi-level, webbed nets that creates a futuristic climbing experience. As kids climb to the top, swing from the ropes or jump from one landing to the next, they'll receive the challenge they need for healthy development into self-assured adults. And with endless design flexibility, Netplex makes it easy to design a unique play environment. Playworld Systems' new Home Dome is the industry's first combination climbing dome and playhouse. Kids ages 2 to 5 will feel right at home with easy-to-climb rungs, inviting perch points and engaging playhouse cues. Home Dome was designed to entice kids outdoors while helping them develop spatial relationships and social skills. Upper-body strength will also get a workout with swinging, hanging and climbing activities. Home Dome's various lines of sight give caregivers and parents peace of mind. Let's make some music! 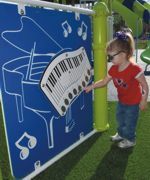 Designed for children of all ages and abilities, the new Miracle Piano Panel adds a fun, musical experience to your play space. Featuring authentic piano sounds with a full scale of notes, children can enjoy it on their own or make music together. The ClubHouse™ Timber Tower is made from durable GFRC (glass fiber reinforced concrete) featuring realistic rock and tree bark textures that blend perfectly into natural surroundings. This lifelike "treehouse" design encourages creative play while providing a challenging rock-climbing event and adventurous crawl tunnel. Developed to be highly configurable, design options are unlimited. Create a basic structure with a couple climbers, panels and a slide, or extend your playground to include multiple platforms and a variety of components. Ensure your playground meets community needs by utilizing research-based best practice design from PlayCore and its family of brands. See PlayCore's design guides for inclusion, nature play and more at www.playcore.com/programs, then send an e-mail to info@playcore.com to describe your project's vision and learn how PlayCore can help. A quality playground is more than colorful equipment; true success is measured in the interest, immersion and active behaviors of the people who use it. All hands on deck as we search for the Pirate-themed panels! SRP believes in developing products that will enhance and develop the creative and strategic minds of children. What better product to achieve this than the Pirate Find Panel set? Children love to satisfy their adventurous needs by exploring the unknown, which can be a great source of stimulus for growing minds. Panel sets are also offered in Dinosaur, Monster and Transportation themes.